Whatever the explanation is, I am the sports fan I am today because of the athletes I have cheered for over the past three decades. While I know that my sports fandom will take on new characteristics as I enter the next phase of my life, I also know that I will pass on stories of the athletes listed below to my future children. Without further introduction, here are my top 30 favorite athletes of my life so far. There was a lot of players in the “also receiving votes” category that fell just short of cracking the top-30. The final nod went to Oklahoma City Thunder forward Kevin Durant. My dream scenario is for Durant to leave OKC as a free agent to sign with the Lakers, helping them win a record-tying 17th NBA championship. Short of that, I hope Durant recovers fully from the injuries that kept him and the Thunder out of this year’s NBA playoffs. Durant has a silky smooth game and is one of the purest scorers I have ever watched play basketball. UCLA is my B-team in college basketball. As long as they’re not playing Michigan, I like to see the Bruins succeed, and after the Wolverines fell on hard times after the Fab Five era, the Edney-led Bruins gave me someone to cheer for. His coast-to-coast game winner against Missouri was a move that I immediately had to try to recreate out in the driveway. The first two Super Bowls that I remember watching ended with Joe Montana as the winning quarterback. While I was not a San Francisco 49ers fan, I always had a soft spot for Montana, especially after my Grandma Hubert painted NFL stars as gifts for me and my brothers following Super Bowl XXIII. Jeff and Mike got Jerry Rice and Boomer Esiason, and I got a painting of Montana that still hangs in my office to this day. Jalen Rose brought the swagger to the Fab Five and the University Michigan. The shaved head, baggy shorts look was cool, especially to little kids like me at the time. Although his professional career included a variety of stops that prevented me from supporting him as much as I did when he was in college, my enjoyment of Rose has grown since he became an analyst for ESPN and a contributor to Grantland. I’d be lying if I said his post-playing career hasn’t helped him stay relevant for me as a sports fan, but it was his role as the point guard for the Fab Five that ultimately earned him a spot in my rankings. The NBA’s reigning MVP is currently one win away from winning his first NBA championship, and I have been cheering him on. Curry’s flashy ballhandling skills and amazing shooting ability make him fun to watch. His businesslike approach and demeanor in post-game press conferences make him hard not to like. He does not fit the mold of the prototypical NBA superstar. Curry’s body type is about as close to what mine was in the prime of my athletic career as an NBA player will ever have, so it’s pretty cool to see a skinny, jump-shooting specialist take the league by storm. Griffey is one of only two baseball players that made my top-30 list. I don’t know if anyone has ever had a sweeter swing in the history of the game, and while his contemporaries—Barry Bonds, Mark McGwire, Sammy Sosa—were filling record books with asterisk after asterisk, Griffey seemingly never succumbed to the temptation of performance enhancing drugs. Long was one of the greatest defensive lineman in the storied history of the Raiders. However, like another Raider on this list, his greatness on the football field was second to his greatest on the virtual football field. Tecmo Super Bowl’s version of Howie Long wreaked havoc on opposing offenses, and for that reason, I supported real life Howie Long even more. During a time period when stars were leaving early for college (or skipping college entirely), Duncan was the rare four-year star at Wake Forest. He was an under-spoken, mild-mannered superstar. 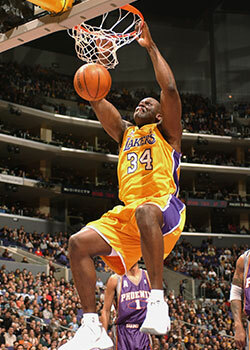 Because he landed on the Spurs, he became a rival of my favorite team, the Lakers. Those two franchises have combined to win nine titles in the 21st century. It was often the Spurs who got in the way of the Lakers and vice versa. Yet as much as I rooted for the Lakers to win, I could never bring myself to hate Duncan and the Spurs. He only earned my respect, and then the last couple of years against the Heat, I got to full-on root for Duncan and the Spurs to win it all. No one made watching football more exciting than Denard Robinson. “Shoelace” scored on a busted play on his first career touch. That was a fitting way to start his career. He was not the best quarterback in Michigan history. He was not a great quarterback at all. He was, however, dynamic. Every time he touched the ball there was the potential that something magical was going to happen. Sometimes it ended in a dumbfounding interception, and that was the risk. Yet it seemed worth it every time that he completed a Hail Mary pass or took off and ran…and ran…and ran. The catch versus Notre Dame. The punt return and the Heisman pose against Ohio State in 1991. Sure, he went on to win a Super Bowl MVP as a returner for the Green Bay Packers, but Desmond Howard is maize and blue royalty. Long before his son, Tim Hardaway Jr., helped Michigan make it all the way to the 2013 NCAA championship game, Tim Hardaway was revolutionizing the point guard position with the killer crossover. Before Allen Iverson, before Steph Curry, there was Tim Hardaway, the original master of the Killer Crossover. Few players have ever had a quicker, more lethal crossover than Hardaway had during his NBA career. In the early 90s, the Lakers suffered a superstar drought. Magic Johnson retired, and Shaquille O’Neal and Kobe Bryant were still a couple of years away. It was during this period that point guard Nick Van Exel arrived on the scene. Van Exel was a smaller version of Jalen Rose, a smooth ballhandler with a sweet lefty jumpshot and enough swagger to survive the bright lights of Hollywood…or the vile fans of the Boston Garden. Entering the 2008 season, the Los Angeles Lakers were in crisis mode. Kobe Bryant, fed up with losing in the first round of the playoffs the two previous seasons, was on the verge of forcing a trade. Instead of dealing Bryant away, the Lakers made a deal to acquire Gasol. Although the trade felt like a steal at the time, it did not seem like a franchise-altering move. Gasol was the 2002 Rookie of the Year, but he had made just one all-star team and had an 0-12 playoff record with the Grizzlies. However, Gasol proved to be the missing piece for the Lakers. His low-key personality was the perfect complement to alpha dog Kobe Bryant, and his versatility allowed him to pair equally well with traditional center Andrew Bynum or stretch-four Lamar Odom. In his first three seasons with the Lakers, Gasol helped L.A. make three straight Finals appearances and win two titles. His 19-point, 18-rebound performance in a gritty Game 7 of the 2010 Finals against the Celtics forever cemented his Laker legacy. Oh yeah, he also inspired Jessie to become a Lakers fan during his time in L.A., so that was a fun bonus for me. Anyone who knows me knows that I do not follow hockey on a regular basis. I watch enough SportsCenter to stay at least peripherally aware of what’s going on, but aside from the occasional playoff game, I rarely watch hockey. However, there was a time in the early 90s when the neighbor next door was a big hockey fan. He even got me to put the basketball down occasionally to play some street hockey in our basement. More often, we played NHL ’93 and ’94 video games. If I had any say, I picked the Penguins to play as Mario Lemieux. When people ask me who my favorite hockey team is today, I generally respond that I don’t follow it enough to claim any team. However, if I had to pick a team, I would go with the Pittsburgh Penguins because of Lemieux. I have a love-hate relationship with Jordan. When I was a young kid, I got caught up in the Air Jordan marketing machine. I had the red MJ jersey and black Nikes. Then, after pledging my allegiance to the Lakers, and after Jordan began winning championship after championship, I got fed up with Jordan. It got to the point where I was cheering on the Utah Jazz in the Finals just to have someone dethrone Jordan. Now, looking back, I realize that I had the privilege to watch the best player of all-time. Whether I was rooting for him as a member of the Dream Team or against him during his runs with the Bulls, no one ever had a will to win like Jordan. I wasn’t consistently a fan enough to put him any higher on the list; I respect his greatness too much to put him any lower. A 9-time Pro Bowl selection and 2015 Hall of Fame inductee, Tim Brown was Mr. Dependable for the Raiders. He caught 99 career touchdowns in 16 seasons with the Raiders. (He added 1 for an even 100 while playing his final season for Tampa Bay.) When I think of Brown’s career, individual plays do not come to mind. What I remember is his consistent production, game after game, year after year. Despite never having a superstar quarterback, Brown always found a way to make his mark as a wideout for the silver and black. Along with his coach, John Beilein, Burke helped revived Michigan basketball, leading the Wolverines all the way to the 2013 national title game. If his clean block of Peyton Siva’s layup attempt in the second half isn’t called a foul, who knows, maybe Michigan wins it all. As it stands, he was the Player of the Year and hit the shot of the year to help Michigan upset Kansas in the Sweet 16. Sanders is the highest ranked player on this list who did not play for one of my favorite team at any point in his career. Sanders spent his whole career as a running back for my dad’s favorite team, the Detroit Lions. One of the greatest “What ifs?” in sports history is “What if Barry Sanders and Emmitt Smith traded places for their NFL careers?” What if Sanders had Aikman, Irvin, and the Cowboys offensive line blocking for him? In my opinion, Sanders would have been the most productive back in history, although he probably would have had to sacrifice some of those negative-2-yard highlight reel runs. As it played out, Sanders made dozens of highlight reel runs but finished his 10-year career 1-5 in the playoffs. The official reason for how I became a fan of the Oakland Athletics is that I liked their colors. The secondary reason was Rickey Henderson. It starts with his all-time record 1,406 stolen bases, a category he led the league in 12 times, and finished in the top-10 a whopping 22 times during his 25-year career. And it ends with a story of when the general manager wrote him a $1 million bonus check. The Athletics’ accounting department realized their books were off by a million, only to find that Henderson had framed the check rather than cashing it. Seriously though, Rickey Henderson stories are the best. When Kobe Bryant’s Lower Merion High School squad defeated my cousin’s Cathedral Prep Ramblers in the 1996 PIAA state championship, I never imagined that I would spend my high school years at Prep cheering FOR him. Sure enough, Bryant and the Lakers won the title during my freshman, sophomore, and junior year of high school. Years from now, I will be telling stories of when I watched Kobe Bryant play basketball. I watched MJ when I was a child. I had the privilege of watching Kobe at his peak when I was a young adult, which allowed me to appreciate the nuances of his game. There are too many big shots from his career to pick just one, so take 15 minutes of your time and watch them all. Big Shot Bob earned his nickname by never shying away from the moment. Horry began his career with the Houston Rockets, winning a pair of titles as Hakeem Olajuwon’s sidekick. He ended his career with the San Antonio Spurs, winning two titles alongside Tim Duncan. 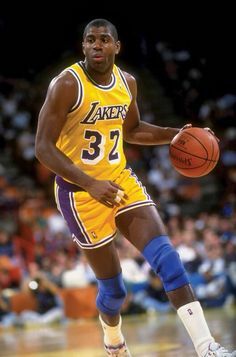 However, it was during a seven-season, three-championship run with the Los Angeles Lakers that I became a Big Shot Bob fan. 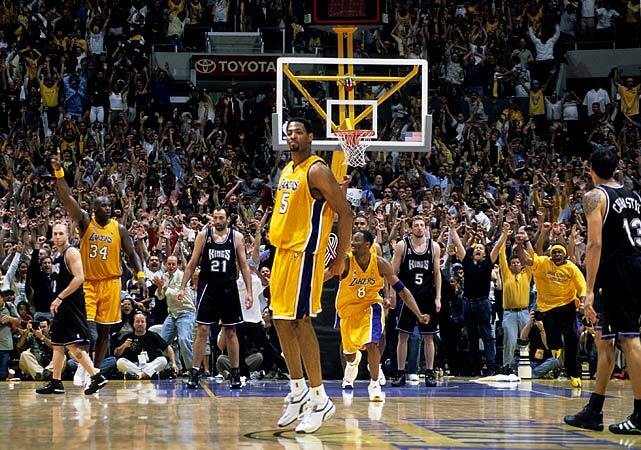 Horry hit numerous clutch shots during the Lakers’ three title runs, but the most memorable shot he ever hit, in my opinion, was the Western Conference Finals Game 4 game-winner to beat the Sacramento Kings. The shot tied the series 2-2 and essentially saved the Lakers’ season. Re-watching that clip still gives me goosegumps. 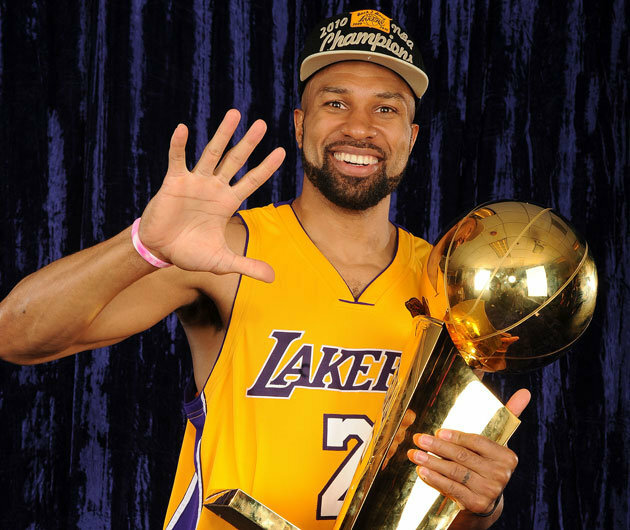 Fisher not only played alongside Horry for those three titles at the start of the millennium, he also played a crucial leadership role as the point guard for the 2009 and 2010 Lakers championship teams. However, the most memorable moment of Fisher’s career actually came against Horry’s San Antonio Spurs in a year the Lakers eventually lost in the Finals. Nevertheless, the shot he made to defeat the Spurs in Game 5 of that series with just 0.4 seconds on the clock was one of the most amazing plays I’ve ever seen, especially since it came on the heels of clutch, would-be game-winning shots from Kobe Bryant and Tim Duncan just seconds earlier. What an emotional roller coaster finish to that game! Since I was born in 1984, I missed out on watching Magic vs. Larry Bird during the height of the Lakers-Celtics rivalry. Of course I have watched the highlights and games on ESPN Classic over the years, but I only wish I had been able to see more of Magic live. Still, his wizardry as a passer and his charisma as a team leader were second to none. His cameo for Kareem Abdul-Jabbar in the 1980 NBA Finals is one of the most impressive feats in sports history, and that performance set the tone for the rest of the decade, which saw Johnson capture five titles in all. 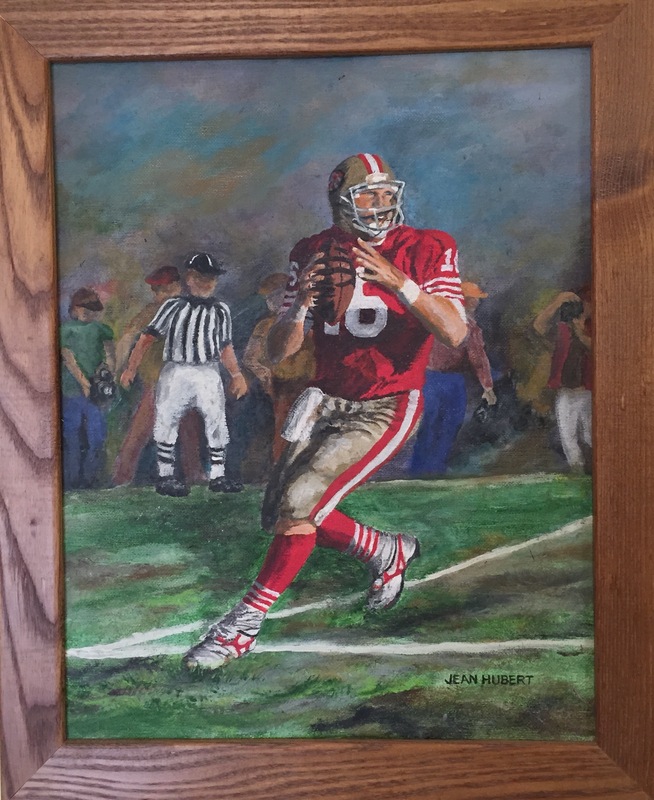 In addition to the aforementioned painting of Joe Montana, I grew up with a Jerry Rice 49ers poster in my room. So it was a great day when one of my favorite players came across the bay and joined the Oakland Raiders in 2001.Rice was past his prime by the time he arrived in Oakland, but he had plenty left in the tank. In his first two seasons with the team, he made 175 receptions for 2,350 yards and 16 touchdowns. And in 2002, the receiving tandem of Rice and Tim Brown helped the Raiders reach the Super Bowl for the first time since I was born. There are great debates about who was the greatest quarterback or running back of all-time, but I defy anyone who suggests that anyone other than Rice was the greatest wide receiver in NFL history. He is the all-time leader in receptions, receiving yards, and total touchdowns. His greatest years came in San Francisco, but I was glad to have him in the silver and black, even for just a few years. Before I had fully pledged my allegiance to the maize and blue, I dabbled with the Notre Dame Fighting Irish, which is not surprising considering how many family members support Notre Dame. 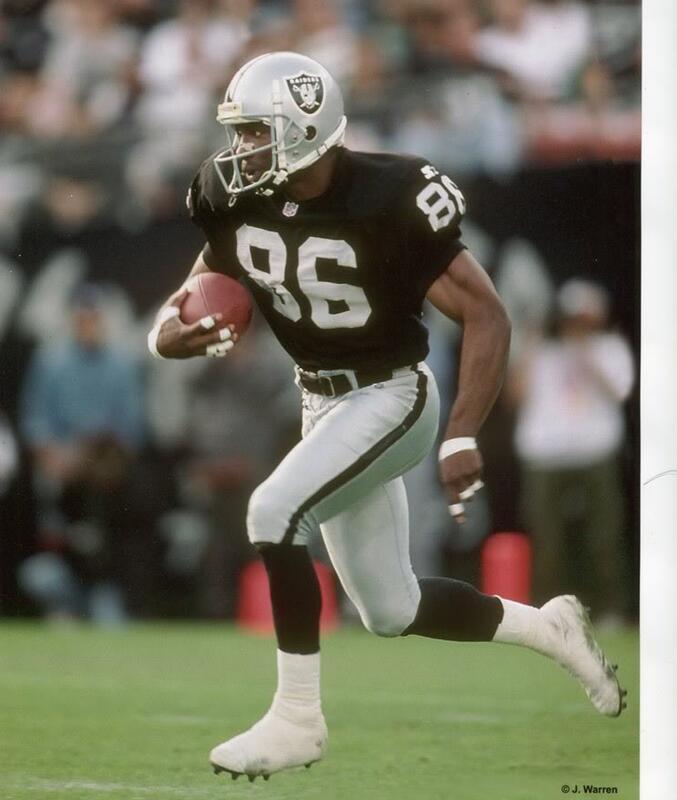 Raghib “Rocket” Ismail was a blur on the field, and when he finally ended up in the NFL with the Raiders (he took a big money offer to play in the CFL after college), I was fully invested. I had the Rocket poster hanging on my wall. A few years later, my family got a dog—a Raiders colored dog, no less—and named him Rocket. In the end, Ismail’s NFL career was underwhelming, but like the poster that hung for years on my wall, he remained meaningful to me. Speaking of posters, I had three different Shaq posters in my bedroom at one time. I had a small one from his Orlando Magic days when liking Shaq was so cool that kids like me also bought Shaq Diesel and watched Blue Chips unironically. I also had two Lakers posters of O’Neal. When he signed with the Lakers as a free agent, I had no idea how much my life as a sports fan was about to change, but that was the moment everything shifted for me. The Lakers became a dynasty and I grew up expecting playoff runs and championships as part of the May-June routine. Oh, how I miss those days. 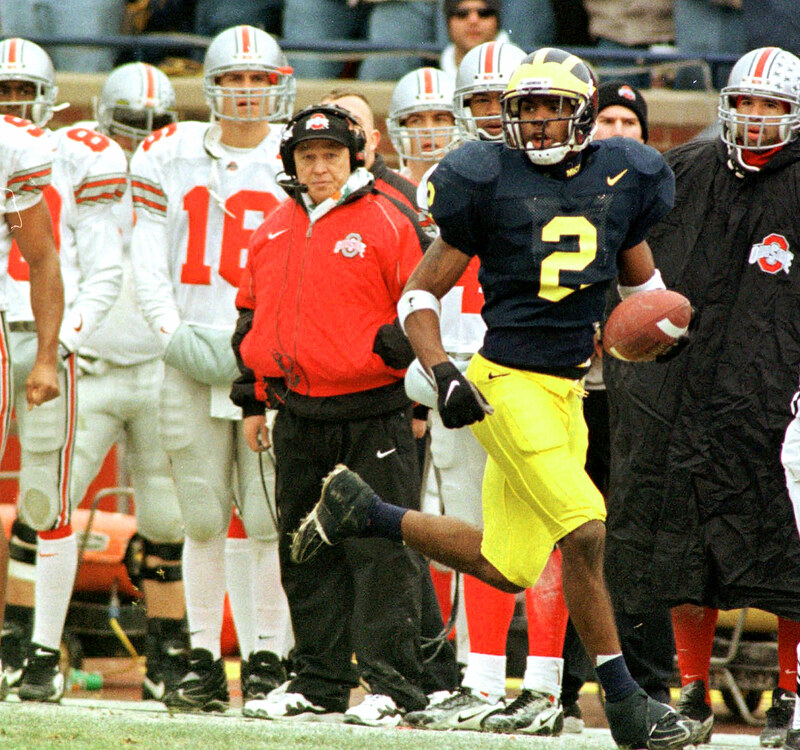 In 1997, Woodson scored on an interception return and a punt return to knock off #4 Ohio State and earn undefeated and #1 ranked Michigan a spot in the Rose Bowl. That performance helped Woodson become the first primarily defensive player to win the Heisman trophy. After Michigan won the Rose Bowl, they earned a share of the national championship. Later that spring, Woodson was drafted fourth overall by the Oakland Raiders. He was named NFL Defensive Player of the Year. Later, as a member of the Green Bay Packers, Woodson was named NFL Defensive Player of the Year and won a Super Bowl. Woodson returned back to Oakland in 2013 and has since tied the record for most defensive touchdowns with 13. It is a shame that the defining moment of Chris Webber’s career for many people was when he called a timeout that his team did not have, effectively ending Michigan’s chances of winning the 1993 NCAA championship game against North Carolina. 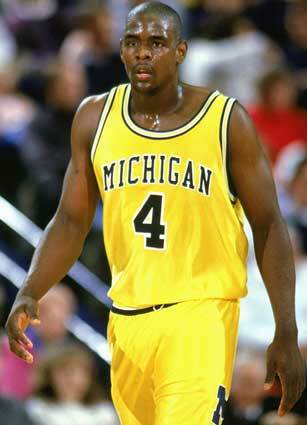 Without Webber, Michigan never would have been in that position in the first place. Despite the collective hype of the Fab Five, Webber was the centerpiece of their back-to-back national runner-up Michigan teams. He was drafted #1 overall by the Orlando Magic and immediately traded to Golden State, so I got a Webber #4 Warriors jersey. After earning Rookie of the Year honors, he was traded to the Washington after the season, so I got got a Webber #2 Bullets jersey. In 1997, the Bullets became the Wizards, so I got a Webber #4 Wizards jersey. While the jerseys changed, Webber’s production remained consistent. His best run was from 1998-2005 with the Sacramento Kings, but Webber’s best chance at a championship fell short when his Kings lost a heartbreaking Game 7 at home in overtime. Ironically, Webber’s Kings lost that series my favorite team, the Lakers. 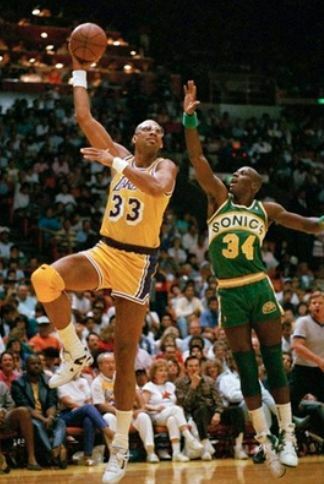 I wrote earlier about missing Magic Johnson’s prime years. That is even more true of Kareem Abdul-Jabbar. Yet my first memory of life prominently involves Kareem helping the Lakers defeat the Detroit Pistons in the 1988 Finals in games that I watched sitting on my dad’s lap. It’s a memory that has been strengthened (and likely distorted) over the years while watching (and re-watching) footage from that series. My dad was a Kareem fan. I was a Kareem fan. Even though he played most of his career before I was born and retired before I entered kindergarten, I have always claimed The Captain as my favorite basketball player. I went back and forth several times debating #1 and #2 on this list. In the end, Bo edged out Kareem.Bo Jackson was the reason I became a Raiders fan. Bo Jackson was arguably the greatest athlete of all-time. He was a LeBron James-level athletic freak except he existed in a world before social media. Then again, maybe it is for the best. The way people tell Bo Jackson stories, he may very well have broken Twitter, Instagram, Vine, and whatever other social media platform of today had they been around during his prime. Bo had a combination of speed and strength that made him nearly unstoppable as a running back, and he was the definition of a 5-tool baseball player. Tecmo Super Bowl Bo Jackson is one of the most legendary video game characters of all-time, but some would argue that the exploits of real-life Bo Jackson were even more impressive. 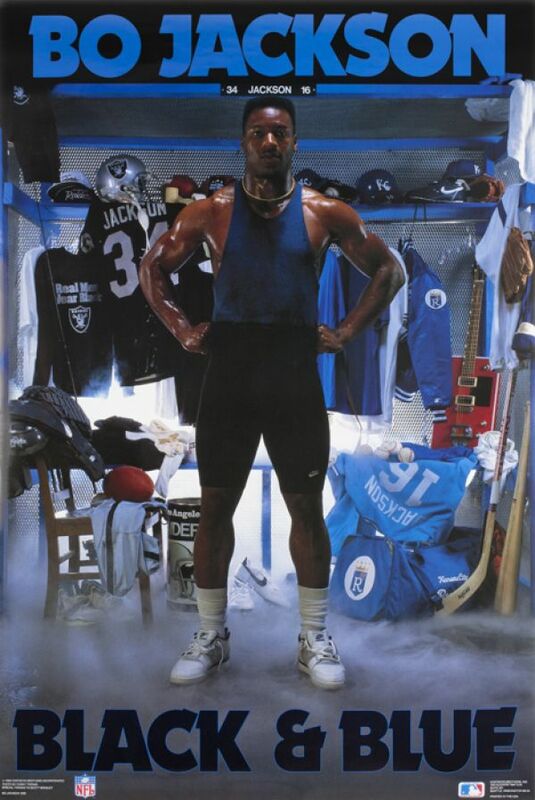 The Bo Jackson poster pictured above hung on my wall from kindergarten until I moved out of my parents’ house as an adult, and I kind of wish I still had it now. It was a shame that Bo’s football career was cut short after just 38 games with the Raiders because of a hip injury. There is no telling how many highlight reel plays fans like me never got to witness because of that injury. Thanks for the memories anyway, Bo.